History was always my least favorite subject in school. The endless lists of names, dates, and places did nothing but make me sleepy. Events that took place hundreds or thousands of years ago in Mesopotamia, or Rome, or Russia may be extremely important, but I could never picture them, never really come to grips with what they were like. Besides, the problem with history is that there’s just so much of it. There’s no way I could keep it all straight. So in my high school days when the topic in class was World War II, I managed to absorb just enough information to get through the exams, and then promptly forgot most of it. I understood the broad outlines—or so I thought—but the details mostly eluded me. I knew, for example, that France was occupied by the Germans, that the Allies landed on D-Day and routed the invading army, and that this was a deciding moment in bringing the war to an end. But the simplified image I had was that of a huge, definitive victory, as though a day after the landings in Normandy, the occupation was over and France was back to normal. That may have been a close enough approximation to get me by in high school, but it was very far from the truth. Four days after D-Day—June 10, 1944—the German army was still firmly in control of most of France, and it was then that one of the most notorious atrocities of the war took place in the quiet French village of Oradour-sur-Glane. Oradour had only about 650 residents and no particular claim to fame. It was a cheery, modern village with all the necessary amenities: butcher shops and bakeries, cafés, hair salons, schools, tailors, a church, a Renault dealership, and even an electric streetcar connecting the village to nearby cities. But it was neither a commercial power nor a tourist destination—just another small village. Oradour was notably insignificant in another way, too: it was not known as a center of the French Resistance against the Germans. It was, or should have been, small enough and obscure enough to stay out of trouble, and indeed, for the most part the occupying German troops had ignored it. But after D-Day, Resistance fighters stepped up their efforts to impede the travel of German troops from across France to reinforce the Normandy contingent. On June 7, not far from Oradour, they blew up a railway bridge, killed several soldiers, and took a high-ranking SS officer prisoner. There is some evidence that the Resistance may also have attacked a German convoy carrying gold, making off with the cargo. The enraged Germans felt obliged to retaliate, and they chose to take their frustrations out on Oradour. The reasons Oradour was chosen have never been entirely clear. It may have been the Germans believed their missing gold was hidden there; it may have been that it was small and easily contained; or it may have been random. In any case, the German army decided they were going to wipe out an entire town. On the morning of June 10, troops surrounded Oradour. They went from building to building, systematically rounding up all the inhabitants of the town and herding them into the public square. Then the women and children were taken to the church and locked inside, while the men were divided into groups and taken into various barns and garages. The soldiers set off a bomb in the church. The women who were not killed by the blast tried to break out to escape the smoke, but they were immediately shot by soldiers waiting outside. Meanwhile, other troops used machine guns to mow down the groups of men, and then calmly stepped through the heaps of bodies, shooting anyone who still moved. In all, 642 people were killed—men, women, and children—all of whom had carefully kept their distance from the events of the war. The Germans did not stop there, however. They were ordered to disfigure the faces of the dead so they could not be identified, and then burn the bodies. After looting the houses and stores, they then burned every one of the village’s 328 buildings. When they left the following day, Oradour was entirely obliterated—a lifeless, smoking shell where a vibrant village had stood the morning before. The story of Oradour is known from a handful of people who managed to escape. Two women and one child climbed out of the church through a broken window, though only one woman survived her injuries; five wounded men escaped from one of the barns; and one child ran when he saw the soldiers in town. Other than those seven, the only survivors of Oradour were about 20 people who fled when they saw the approaching troops and residents who were out of town for the day. The French government decided not to rebuild Oradour, but to leave the remains of the old village as a monument to the dead and a reminder of what had occurred there. 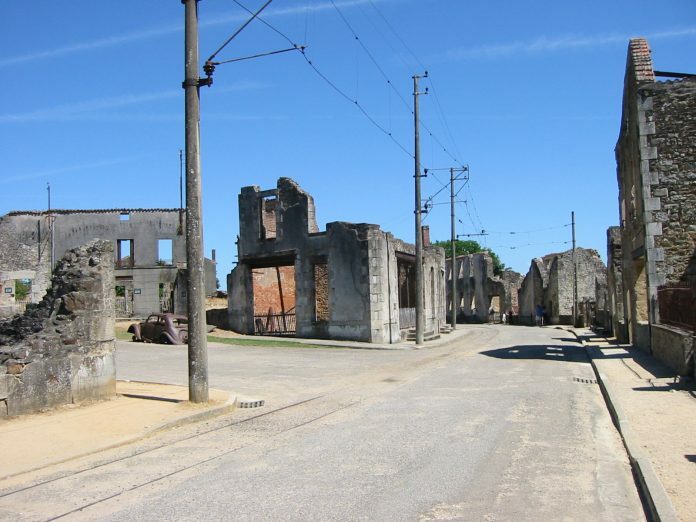 Nine years later, in 1953, a new village of Oradour, adjacent to the former site, was opened. That same year, members of the SS who had participated in the Oradour massacre were tried for war crimes, with several of them being sentenced to death or a lifetime of hard labor. Meanwhile, a debate was taking place regarding French citizens who had been forced to serve in the German army: should they, too, be punished for their roles in the war? A week after the guilty verdicts were handed down, France resolved that issue by passing a general amnesty law, freeing all those who had been convicted. This infuriated the survivors and the families of those who died in Oradour, and strained relations between the new Oradour and the national government for many years. We drove into Oradour on a hot, cloudless day in June 2003 while on vacation in France. The only entrance to the old village is through a modern visitors’ center, with an extensive exhibit detailing the events leading up to the massacre, a video featuring stories from the survivors, and a description of the bitter aftermath. After taking in the sobering history, you walk through a tunnel into the town. For the most part, everything that was made of wood or glass was destroyed—roofs, floors, windows, doors; only stone walls, sidewalks, and metal fixtures remain intact. Small signs indicate the function of each building and the name of its former owner. I was surprised at how large and spread out the village was; the scale of the destruction was truly astonishing. On the edge of the village is the cemetery, which for me was the most striking part of the town. It was deeply disturbing to realize that the entire town is buried here, and more disturbing still to read, again and again, “Died June 10, 1944.” Unlike the sites we had visited in Paris where the nameless dead of centuries ago were interred, this cemetery struck much closer to home. Though I have no personal connection to anyone from Oradour, I somehow felt as though this could have been my village, my friends, my family listed on the roll of the dead. It’s hard not to be affected by the randomness and ruthlessness with which so many innocent people were killed. Despite the controversy over amnesty for those who took part in the killings, the overall message conveyed to Oradour visitors is not merely to remember, but to remember with equanimity. The massacre of Oradour, after all, was one of retaliation; the only purpose revenge would serve would be to perpetuate the cycle of more retaliation. The world does not need more terror, death, and destruction—whether in an idyllic French countryside, in the Middle East, or anywhere else. The only way to stop that cycle is to take the bold and audacious step of countering violence with peace. Note: This is an updated version of an article that originally appeared on Interesting Thing of the Day on July 23, 2003, and again in a slightly revised form on November 3, 2004.